Finding home where you are. | Tweak your week! »Daily Living»Finding home where you are. Victor was standing guard this morning. We picked him up last evening from my daughter’s house after 6 weeks. Never thought I’d miss him so much. After sniffing around his new home for a bit he settled right back in as if he’d never left. I think I’m much the same but without the sniffing. I settle in to a new home easily and quickly. Knowing that my faith is sure and unchanging keeps me balanced no matter the street address. Are you the kind of person that accepts change easily? Breathe into the day. Find the home inside your heart dear one. Life may bring unexpected change but remember you are loved, unconditionally. 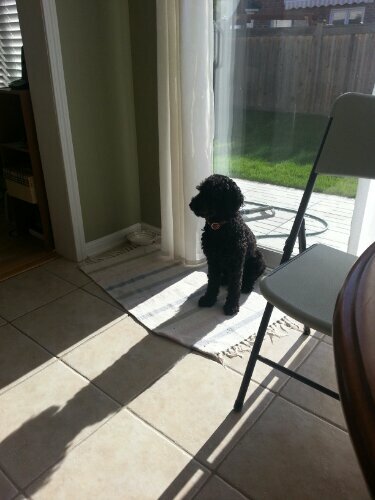 A lesson learned from Victor the miniature poodle with a Napoleon complex. ← When indecision takes over…. Wonderful blog, and such a cute pic. Victor is so sweet! I’m glad he and you feel at home already, Barb!